Day Pass - $52 (after 20% discount) -Saturday or Sunday - See an entire day of music for one low price. To purchase simply put premium tickets (the dark purple ones) for both shows during either Saturday or Sunday in to your cart and purchase at once. The discount should apply automatically at checkout. Multiple pass purchases are OK, but make sure you have the same number of seats for each show. A multifaceted artist, Jay Gandhi's music is at once reflective of his devotion to his Guru, the inimitable legend of the bansuri, Pt Hariprasad Chaurasia, as well as a diverse range of other musical influences. Jay’s initial training in Hindustani music was under Smt. Kum Kum Sanyal (vocal) and later in bansuri under Pt. Ronu Majumdar and Pt. Raghunath Seth. From his formative years, Jay’s musical inclinations were not limited to that of the Indian sub-continent and he was also strongly drawn to the music of the African diaspora and American Jazz in particular. With the desire to bring the sound and versatility of the bansuri into the jazz idiom in a meaningful way, he formally studied Jazz Performance at Oberlin College/Conservatory of Music (Ohio) and trained under such Jazz luminaries as Gary Bartz and the late Marcus Belgrave. A recipient of the prestigious AIIS Performing Arts Fellowship, Jay maintains a busy schedule performing for audiences across the globe. He currently is based out of New York City, where he is very active as both a teacher and performer and also as a founding member of Brooklyn Raga Massive, a prominent musicians collective. 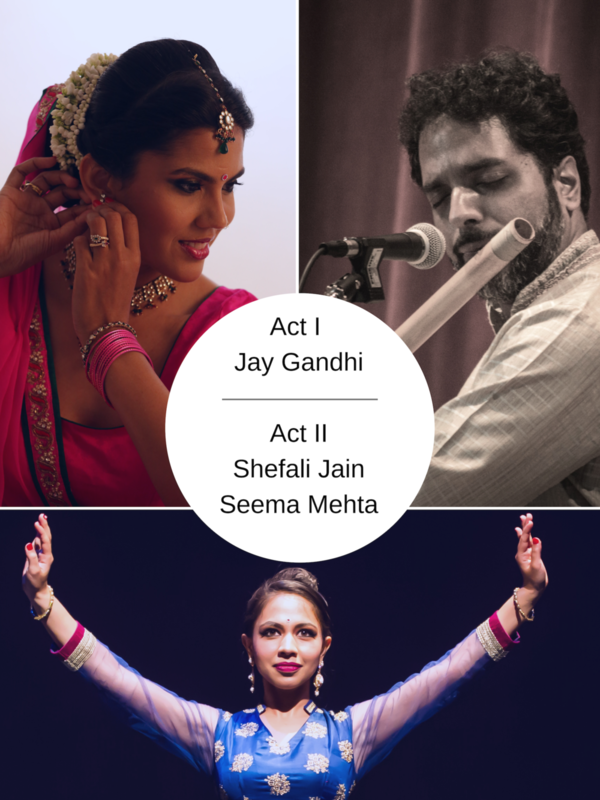 Shefali Jain is an emerging Kathak artist who has trained for over 15 years with Gretchen Hayden and the late Kathak maestro, Pandit Chitresh Das. She has presented concerts at venues such as the Boston University Dance Theater and Alvin American Dance Theater, and has received funding from the National Endowment of the Arts and the Massachusetts Cultural Council. Shefali is also a founding artist of the Leela Dance Collective, performing in innovative works such as the Son of the Wind and California Gharana. In addition to performing, she is committed to passing on the rich tradition of Kathak to the next generation. She is a senior teacher at the Chhandika Institute of Kathak Dance and co-director of the Chhandika Youth Ensemble. A fine artist, Seema Mehta graduated from the Academy of Art University in San Francisco specializing in painting. She has trained in a traditional setting with the legendary Kathak master Pandit Chitresh Das under the Guru-shishya parampara for fifteen years. Her lineage dates back to the great Gurus of the Lucknow and Jaipur gharanas. Seema’s style therefore strikes an admirable balance between the two styles, the subtle and graceful versus the warrior like vigour through powerful footwork and chakkars. Her high energy captivates the hearts of the audiences. She has been training in Hindustani vocal with thumri expert Dhanashree Pandit Rai, and her vocal study continues to inspire her to create new works. Seema is the Director of Chhandam Nritya Bharati, where she teaches close to sixty students in Mumbai. Her passion lies in teaching the next generation and passing on the knowledge received by her Guru. Going beyond the traditional preview of dance, Seema’s vision is to create a movement by touching lives through her work. Her aim is to create an empowered next generation of artists who can make dance their livelihood by maintaining the highest artistic standards.